Acquainting myself with audio products Id otherwise be unlikely to try stands first among this gigs pleasures, and so far Ive been fortunate: everything Ive covered has been good, effective stuff. Heres hoping the enchantment holds for these items, both from Walker Audio of Audubon, Pennsylvania -- about which, first, an aside. A few years ago, an audiophile chum who lives in Merion Station, not far from Audubon, took me on a visit to Lloyd Walkers establishment. There in the workshop, in stages of completion, lay the Proscenium Gold Signature turntable on which Walker has built a reputation for cost-no-object, top-flight performance. While admiring the quality of parts and workmanship, I admitted to Walker that my interest in the turntable dwelt in the abstract -- Id sold off my LPs to make room in my small urban digs for a growing CD collection. (I was then, and remain, a music reviewer.) My host maintained his courteous demeanor, but I could tell from his fleeting wince that, in his eyes, I was now the barbarian whod slipped through the gate. It remained withal a pleasant and instructive afternoon. Lloyd Walkers a gent. Cast your memory back beyond Bic lighters and paper matchbooks to those charming little boxes with colorful labels and abrasive strikers on the side. Remove labels and strikers and envision a pair of those boxes made of featureless copper. Dot the corners and two points along the top with silver solder. Attach two silver crab claws on slender silver wands and youve an attractive, high-end thingamabob called the Walker Audio Ultimate High Definition Link. The Links crab claws, made of "ultra pure" silver, are spade lugs that you attach to your speaker terminals in parallel with your cables. Properly installed, the Link is freestanding, touching neither speaker nor floor. Its unusually fragile, cryogenically treated contents, "built to proprietary specifications," are encased in protective wood. (Theres no way to peek inside a Link without destroying it.) Walker reports an assembly mortality rate of 10-15%. As to why cryogenics, I would have choked over the explanation were it not for my happy association with Bill Stierhouts eternally spooky Quantum Resonance Technology thingamabob. Im told that cryogenics, like QRT, operates at the molecular level to get the traffic to straighten up and fly right. If you require a deeper understanding, check with your village explainer or send me back to school for a doctorate or two. Ive still no idea how QRT operates (thus "eternally spooky"), never mind Walkers UHD Link. Happily, what I hear takes precedence over what I need to understand. The Links are intended to minimize noise, specifically "electronic glare," EMI, and RFI (electro-magnetic and radio-frequency interference). Noise -- or glare, grain, grunge -- is what we dont want. Under the electronics in my system, Ive got other gizmos that defend against audible neer-do-wells, including the excellent Harmonix Reimyo ALS-777 line conditioner and Silent Running Audio isolation platforms. With respect to the Reimyo, the recent arrival of Harmonix X-DC Studio Master power cords will be the subject of another report. In short, Walkers Links operated in as favorable an environment as I can provide. The information sheet accompanying the Links tells us that "[t]he music will become more natural sounding. The electronic glare will disappear. The [soundstage] will open up to become better focused, more transparent. Harmonics will be cleaner, clearer and the dynamics will be faster and sharper, without harshness." Id have put "electronic glare will disappear" first. In my experience, reducing glare enhances all of the above, depending on how much glare is eliminated. Whether this can be measured scientifically is interesting but far from urgent, at least for me. Listening for enjoyment to a familiar system in familiar surroundings is about as subjective an activity as exists. Ones ear-brain nexus grades sonic differences. The buck stops there. "We developed the original HDLs six years ago. They were well received by everyone who used them and got enthusiastic reviews from Ultimate Audio, Listener, SoundStage!, Enjoy the Music, among others, along with The Abso!ute Sounds 1999 Golden Ear Award. We later developed a special RFI/EMI shield and [a] unique grounding technique and named the new version Mk.II. "Then one day we decided to go for a no-holds-barred version using some of the ridiculously expensive parts we put in our Reference phono amp. The result startled us. We then experimented with cryogenic treatments and discovered that the best of them for our purpose was a slow-immersion process. It is expensive and takes time. "The Ultimate HDLs remove RFI and Ultimate high frequencies from your system. The units fragile parts, which are matched to 0.05 percent, must be routed precisely into the wood block for protection. The wire and spades are Ultimate-pure silver and each piece is directionally wired. The Ultimate HDLs need four to five days to break in. During the breaking-in stage, they will sound great for 30 to 45 minutes, then bright, then dull, then bright again. After they have matured, they will settle down and become neutral. "With the removal of RFI and Ultimate high frequencies, the soundstage will open up, becoming taller, wider, and deeper. The music will sound more natural with improved focus and harmonics, and the bass will have more impact and definition." My speakers are Wilson WATT/Puppy 6es. The upper-unit WATT connects to the Puppy by way of a jumper that, beginning with this model, cannot be replaced without invasive surgery and a voided warranty. 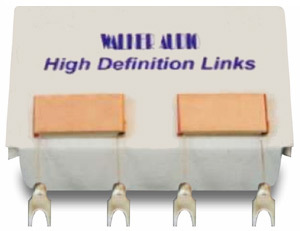 Although the Wilson system offers two pairs of binding posts, one each for WATT and Puppy, Wilson instructs against biwiring: speaker cables connect to the Puppy. At Walkers suggestion, I moved the Links from the lower to the upper posts, and thats where I attached and detached them for the following comparisons. Allow me to share a few valuable life-lessons: Away from home, never pass up an opportunity to pee. While at home, never attempt to evaluate anything to do with audio when you have a head cold. (Feeling fine now, thanks.) And give your UHD Links several days of good, solid use before attempting to evaluate their effects. Walkers characterization of the maturation periods bright-dull-bright progression seems about right. Prior to my first Links in, Links out comparison, I felt that the Ultimates were living up to Walkers claims. My first test disc, Night Music [Harmonia Mundi USA HMU 907280], which includes Mozarts Eine kleine Nachtmusik, Serenata notturna, Ein musikalischer Spa�, with Andrew Manze conducting The English Concert, confirmed that impression. Nothing reveals difference quite like a well-recorded ensemble of violins, violas, cellos, and double basses. Pretty much as I anticipated, in removing the Links, glare (to use Walkers term) somewhat compromised the strings unique textures, the riches of their harmonic depth. In short, opulence gave way to edge, with thus less transparency and soundstage verisimilitude. It wasnt a matter of "Oh my God, where are my earplugs?" Conversely, for an audiophile, subtle as an expression of degree carries little weight. Glare impedes beauty -- in short, is nasty. So far, Walkers UHD Links were performing as advertised. Listening to a New World Records CD with and without the Links turned out to be one of the most interesting evaluations Ive ever done. New World specializes in American art music. Mel Powell (b. 1923, NYC, not to be confused with Morgan Powell, whose music the label has also released) operates across a broad spectrum of jazz and classical composition. Engineer Tom Erbe recorded Powells attractive Sextet of 1996, for flute, clarinet, violin, cello, piano, and percussion (performed by the California EAR Unit, Stephen L. Mosko conducting), with just the right sense of listener distance [New World 80616-2]. Chamber musics an intimate affair. One wants to feel close, not in the middle of a cathedral -- a production tendency among some Brits and others. With Links in, the Sextets instrumentalists sounded about perfect: remarkable warmth, harmonic detail, and soundstage distribution. But heres where it got interesting: With Links out, it wasnt so much a question of what I could hear in the way of glare -- and I could, though the differences werent abundantly obvious -- so much as the sense of discomfort I experienced. I became rather antsy, with an urge to be elsewhere. I think I understand what was going on. The strings on the Harmonia Mundi release sparkle. Had they been recorded differently, theyd perhaps have sounded mellower, as if in another type of hall. One detects glare more easily with this kind of sound. In a recording of a rather milder character, such as the Powell disc, the glare becomes, in effect, subliminal. My RS Audio Palladium interconnects, Nordost Valhalla speaker cables, and Mark Levinson No.390S CD player and No.33H mono amps, are, as I hear them, exemplars of uncolored, flat-out truth. Like Madam Ludmilla and Her Magical Tarot Deck, the system reveals all, including the uninvited. Ive begun to understand why I was spending less time than I should listening to recordings: That nigh-inaudible dollop of glare was getting me down. When we talk about noise, we refer first to the degree of silence behind the music. The term is noise floor, and the lower the better. But glare is something that accompanies sound and has naught to do with the noise floor. The distinction is important: A dead-silent system is one thing, the presence of glare another -- even if you think you cant hear it. First-rate electronic components have been with us for some time, but significant inroads on reducing noise and glare are relatively recent developments. Were I to go from solid-state to tubed amplification, Id probably hear a difference, yet differences do not necessarily equate with superiority. Its almost too obvious a point to make, but a diminution of the extraneous is always a change for the better. My components performance "improve" with every enhancement of their environment. The less besmirched the signal, the better the sound. Could what we hear as a recordings deficiencies sometimes originate elsewhere than in a CDs pits? My experiences with the Walker Links suggest that they might. I havent banished sonic degradation -- grunge, glare, grit, grain -- in one easy step, nor, probably, is it utterly absent from my system even now. As happy as I am with my SRA platforms and Reimyo line conditioner and its dedicated power cords, when I remove Walkers UHD Links, a door better kept shut opens a tad wider. I hear a difference. Like just about everything else in high-end audio, the UHD Link isnt cheap. Is it worth $650-USD/pair? In Audiophilese, the question and its context read: Anything better is worth whatever. If I like it, can I afford it? About their Vivid disc-treatment system, Walker Audio says, "We developed Vivid on a video system. Depending on the recording, the picture improved 10 to 30 percent, as did the sound. Vivid is non-abrasive. It cleans and de-statics DVDs, CDs, SACDs, and contains an optical enhancer that renders the plastic more transparent to the laser. Vivid does not remove scratches. They also become more transparent, so that the laser is less tempted to mistrack. To remove a scratch, the plastic must be ground down to the scratchs lowest level. The abrasives used to accomplish this create a lot of fine scratches instead of the one or however many there were to begin with. This is robbing Peter to pay Paul. We do not repackage an existing cleaner. We make Vivid here." Ive used Vivid on a few dozen CDs. Like the Links Ultimate High Definition tag, the products name strikes me as apt, although, again, were not in two-by-four-upside-the-head territory. I didnt hear a difference on the other side of the county line, nor did any recordings character change. Rather, I had the sense of a fine veil being raised. Yes, I agree, the lifted-veil bits a tad tired, but some clich�s get that way because they do the job. I cant think of a better way of putting it. I dont think anyone whos been into audio for any length of time can have forgotten the Armor All debacle of some years ago. Sam Tellig, in Stereophile in the 90s, recommended this automotive preparation as a CD-enhancement treatment. It did some damage and provoked complaints. Vivid comes with one advisory only: Dont use it on those few SACDs finished in gold on their playing surfaces. Otherwise, nihil obstat, including gold-tinted foil embedded below the playing surface. Vivid sounds to me an effective tweak. 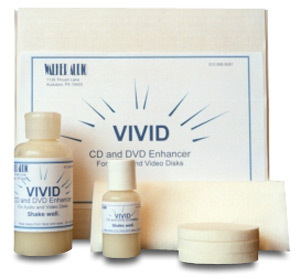 If youre as pleased with Vivid as I have been and you have a large CD collection, youll need a system for identifying the discs youve already treated -- according to Walker Audio, one application is all a disc needs. Stationery stores stock adhesive-backed color-code labels. I apply little circles three-sixteenths of an inch across to the jewel boxs top cover: green for mixed programs Ive recorded by composer on index cards, white for discs Ive treated with Vivid. Like the UHD Links, the treatment kit stays here. Prices: Ultimate High Definition Links, $650 per pair; Vivid Basic, $45 (one 3.5-ounce bottle); Vivid Deluxe, $70 (one 4.5-ounce bottle, one 1-ounce bottle, sponges, buffing pads). Warranty: Two years parts and labor (Ultimate High Definition Links).